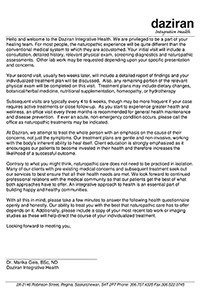 Naturopathic Doctors differ from conventional medical physicians in that we come from a wellness model not an illness model. We attempt to stimulate the body’s ability to heal itself by using a number of techniques all of which are gentle and, for the most part, non-invasive. Treatments can take on many forms ranging from removing obstacles to health to giving the body a push in the right direction by correcting nutritional deficiencies or using botanicals to affect change. At your first appointment, Dr. Geis, N.D will conduct an extensive interview that includes a detailed health history, relevant physical exam and screening diagnostics. Other lab work may be requested depending upon your specific presentation and concerns. This will take between 75-90 minutes. Your second visit, usually 2-4 weeks later and about 45-60 minutes in length will include a detailed report of findings and your individualized treatment plan will be discussed. Any remaining portion of the physical exam will be completed at this time. 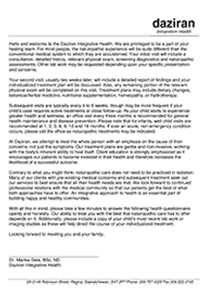 Treatment plans are geared to the unique needs of the individual and may include the following: diet and lifestyle recommendations, nutritional supplementation, botanical extracts, home hydrotherapy and weekly acupuncture treatments. Subsequent visits are typically every four to six weeks but might be more frequent if your case requires active treatments or close follow-up. As you start to experience greater health and wellness, an office visit every three months is recommended for general health maintenance and disease prevention. If ever an acute, non-emergency condition occurs, please call the office as Naturopathic interventions may be indicated. If you’re not able to make it into the office, we also offer house calls, email, and phone consultations. House calls can be booked for initial, second, or follow-up appointments for an extra $20.00 on top of the respective fees of those appointments. Email and phone consultations are based on the length of the visit at a price point of $18.50 for 5 minutes. All services and dispensary items are paid for at time of service. A reimbursement for a portion of your visit may be claimed through your extended health care plan. If you have extended medical coverage, you can send a copy of your receipt to your extended health care provider and, depending on the plan you have, you may get a partial of full reimbursement, up to your yearly limit. Laboratory tests are priced on an individual basis. Cancellations within 24 business hours of the appointment time will be responsible for 50% of the appointment fee. Cancellations without ANY prior notice will be responsible for the FULL appointment fee. Please be advised that this Cancellation Policy is strictly enforced. Cash, cheque, Debit, Visa and MasterCard are accepted. American Express is not available at this time.